Did Luke Know and Use Matthew? The Parable of the Talents/Pounds as a Test Case | Is That in the Bible? I recently wrote an article on the Synoptic Problem and how editorial fatigue — consistency errors made by one writer who is copying another — is a key type of evidence showing that both Matthew and Luke were based on Mark. If you don’t know what the Synoptic Problem is, you should go read that article before this one. In addition to the material Matthew and Luke copied from Mark, we often find material shared in common between Matthew and Luke that is absent from Mark. This content is known as the Double Tradition, and it presents us with a puzzle. Regardless of its pre-Gospel origin (e.g. church teaching, oral tradition about Jesus, or other texts), it shows a direct literary relationship between Matthew and Luke, as indicated by identical wording and other close parallels. Did Luke get this material from Matthew? Did Matthew get it from Luke? Both possibilities seem unlikely for a number of reasons; for one, Matthew and Luke differ drastically on key stories not found in Mark, like Jesus’ nativity and the resurrection appearances. If, for example, the author of Luke knew Matthew, why did he completely reject great story material like the adoration of the Magi and the flight to Egypt? Why provide a genealogy completely different from Matthew’s? And so on. For this and other reasons, scholars since the 19th century have generally considered the Double Tradition to come from a shared “sayings” source referred to as “Q”. Under the Q hypothesis, the authors of Luke and Matthew were unaware of the other’s work, but they ended up writing similar Gospels because both had Mark and Q as their main sources. Where they had no common sources, their stories diverged greatly. More recently, a few scholars have challenged this view, dispensing with Q and proposing that Luke did in fact use Matthew after all. Mark Goodacre of Duke University in particular has been developing this theory, and he thinks he has direct evidence in the form of editorial fatigue (see bibliography below). I’d like to look at one of his key examples and see if it holds up to scrutiny: the Parable of the Talents/Pounds. We’re not going to solve the whole Synoptic Problem here; we’re just seeing what we can learn from a single passage. One problem with most approaches to the Synoptic Problem is that they fail to take into account the earliest attested form of Luke: the Gospel used by the Marcionite church in the early second century. Though eventually condemned as heretics, the Marcionites were a widespread and influential Christian sect. Their founder, Marcion of Sinope, was a bishop and a wealthy shipmaster based in Pontus, Asia Minor. Many pre-Nicene church fathers, including Justin Martyr, Tertullian, Irenaeus, Clement of Alexandria, and Epiphanius, wrote copiously to defend their catholic views against their Marcionite rivals. Marcion’s Gospel simply went under the title Evangelion (“Gospel”) and was a shorter edition of Luke with some notable differences here and there. No manuscripts survive, but because it was so widely quoted by the aforementioned writers to criticize Marcionite theology, most of it can be reconstructed. Here, we’ll be using Jason BeDuhn’s recently published reconstruction (see bibliography below) for our purposes. The historical relationship of Evangelion to canonical Luke has been the topic of some debate. I accept BeDuhn’s arguments that the traditional view — which assumes Evangelion was an altered version of Luke — is no longer tenable. The alternatives are (1) that Luke is a modified and augmented version of the Evangelion, and (2) that both were derived from an earlier “Proto-Luke”. For our purposes here, there is no practical difference. Most readers should be familiar with this parable, a perennial favourite preached regularly from the pulpit. The Matthean version about talents (Matt. 25:14–30) is more popular than the Lucan version about minas, or pounds (Luke 19:11–28). The basic plot goes like this: a master is going away for a while, so he entrusts some money to his servants. When he returns, they show him what they did with it; two invested it and earned healthy returns, while the third hid it for safekeeping. The master is pleased with the first two but irate toward the third, whom he condemns as “wicked”. In Matthew, the master summons three slaves and gives them varying numbers of talents. Upon the master’s return, the three slaves come before him to give an account of themselves. The first two doubled the money and are “put in charge of much”; the third earned nothing, and his talent is given to the first slave. In Luke, the nobleman summons ten slaves and gives them ten minas (one each). Upon the nobleman’s return, Luke has just three slaves give an account. The first two earned healthy returns (ten-fold and five-fold) and are rewarded with cities; the third earned nothing, and his mina is given to the first slave. Luke’s parable started out with ten slaves but ended with three, like Matthew’s has. Giving the third slave’s money to the first slave seems like a trifle when the first is already being rewarded with ten cities. How strong is Goodacre’s conclusion? For starters, this parable isn’t quite like the clear-cut examples we looked at of Luke and Matthew copying Mark — the John the Baptist story, the Parable of the Sower, the feeding of the five thousand, and Jesus’ trial before the Sanhedrin. Luke and Matthew stayed much closer to Mark in those instances, with extensive verbatim copying. Here, though we have some identical wording, there is less of it; the parable is told in different narrative contexts, at least one of them has been heavily reworked from its source (whether that source is Matthew, Luke, or Q). Is Luke’s parable as incoherent as Goodacre thinks? Is Matthew’s version clearly the superior version? A nobleman is going to a distant country to receive a kingdom for himself. (v. 12) The nobleman represents Jesus, who will shortly die and ascend to heaven to receive his kingdom from God. In the meantime, his money his entrusted to ten of his slaves. They are ordered to conduct his business while he is gone. (v. 13) Jesus’ followers are commanded to continue his work while he is gone. The nobleman receives his kingdom and returns home. (v. 15) Jesus returns as king. The slaves give an account of themselves. Two who earned large returns are given authority over cities in the new kingdom. Another, who hid the mina in a cloth, is castigated for disobeying the nobleman’s command, and his mina is taken away. (vv. 16–24) Christians who remained faithful will be rewarded with power and wealth in Jesus’ kingdom. Those who were unfaithful will not be rewarded. In verse 14, who are these “subjects” who hate the nobleman? If the nobleman’s journey is an analogy for Jesus’ ascension to heaven, where and how is this delegation going to make their petition? Verse 27 sort of fits the analogy, but the portrayal of the nobleman (i.e. Jesus) as a cruel tyrant who slaughters his subjects is disconcerting. It sounds like something King Joffrey would say. This is where Marcion’s Evangelion comes in. Evangelion was missing these two verses as far as we can tell, and that probably means they weren’t part of the original parable. Furthermore, nearly all scholars agree that they are a clear reference to Archelaus, who ruled Judea for about ten years. According to Josephus (J.W. 2.1ff. and Ant. 17.206ff), Archelaus travelled to Rome upon the death of his father, Herod the Great, hoping to be crowned king of Judea. A delegation of Jews opposed to Archelaus also went to Rome and petitioned Caesar Augustus not to make Archelaus king. Augustus decided to give Archelaus control of Judea, but as ethnarch rather than king. Later, upon returning to Judea, the ruthless Archelaus slaughtered numerous Jews during Passover for fear they were rebelling against him. It appears that a later editor decided to enhance the parallels between Jesus and Archelaus by adding verses 14 and 27 to the story (based on details he may have learned from Josephus), which survive in canonical Luke. We can only guess what that editor’s motivations were. Verse 25 is also awkward because of how it interrupts the nobleman’s speech. (Verse 26 continues his speech, but without indicating a change in speaker.) However, this verse is also unattested in Evangelion and is missing from several ancient manuscripts of canonical Luke. We may surmise it was not part of the original parable. Without these additions, we are left with a coherent parable that is shorter and simpler than Matthew’s. It’s starting to look like Luke’s version might be more original. Another New Testament scholar, Delbert Burkett (see bibliography), rejects the idea that Luke used Matthew. He and several others think the discrepancies in Luke’s account — mainly, whether there were ten or three slaves, and why the first slave’s reward includes money — are a result of Luke combining two non-Matthean variants. In fact, the number of slaves isn’t such a problem after all. When Luke introduces ten slaves, are we supposed to think he intends to have all ten of them report to the nobleman in the parable, one after another in tedious fashion? Not at all; it makes perfect sense to show just a sample. The text mentions the first one, the second one, and another one (or “the other one”, depending on the manuscript). Furthermore, this would explain who “those standing by” in verse 24 are: the remaining slaves who haven’t been interviewed yet. Here, it is Matthew who presents a difficulty, since it’s unclear in Matt. 25.28 who the master is talking to. As for the slave receiving money in addition to cities, this is just my own observation, but doesn’t Matthew’s version have the same problem? Sure, being put “in charge of many things” and “entering into the joy of the master” are more vague rewards than being given authority over cities, but they still render monetary rewards unnecessary. There are other possibilities in addition to Goodacre’s and Burkett’s solutions. It’s unknown, for example, whether verse 24 was even present in the Evangelion. If it wasn’t, it might not be part of the original parable. At any rate, the case for editorial fatigue here is somewhat flimsy. Turning the tables: is Matthew’s parable coherent? In Luke, the slaves are commanded to “do business” by their master. The slaves in Matthew are given no such command. What, then, is the third slave in Matthew guilty of? Only in the Lucan parable has he acted contrary to orders. In Luke, the servant who earned the highest returns gets the third servant’s mina. In Matthew’s version, the first two servants showed the same ability, earning 100% on their investments. It’s not clear why the first one deserves the extra talent. Other indicators suggest that Matthew’s version of the parable is a secondary adaptation. In particular, Matthew’s spiritualizing tendency is on full display. Just as he spiritualizes Luke’s first beatitude, “blessed are the poor” (Luke 6.20) into “blessed are the poor in spirit” (Matt. 5.3), in this parable he spiritualizes the reward of literal cities in Luke into sharing “the joy of your master”. He also adds a spiritual punishment for the third slave, who is condemned to “the outer darkness where there will be weeping and gnashing of teeth”. We also see elaborations in Matthew’s version. Luke’s “well done, good slave!” becomes Matthew’s “well done, good and trustworthy slave!” Luke’s “you wicked slave!” becomes Matthew’s “you wicked and lazy slave!” It is more likely that Matthew has added these embellishments, than that Luke found them objectionable and removed them. Matthew also has an additional phrase in v. 29, “and he will have an abundance”, that is missing from Luke. We can ask then, whether Matthew was copying and adapting a source he shared with Proto-Luke, or whether he was copying from Proto-Luke itself. Perhaps this is the lynchpin: both Matthew and Luke end their parable by quoting Mark 4.25: “For to him who has, more will be given; and from him who does not have, even what he has will be taken away.” In Mark, this statement occurs in an entirely different context — as part of a string of parables and proverbs given near the beginning of Jesus’ ministry. It seems astonishingly unlikely to me that both Matthew and Luke would, by coincidence, add this quote to the end of the same parable they got from Q. Far more likely is that this quote “hitched a ride” when Matthew copied and adapted the parable from proto-Luke. At least, that’s how it seems to me. Taking all the aforementioned observations into account, we can construct a hypothetical model for how this parable developed in Luke and Matthew. It does not match Goodacre’s hypothesis that Luke copied Matthew; however, it is similar to Alan Garrow’s Matthew Conflator Hypothesis, and almost identical to Matthias Klinghardt’s recent theory that Matthew drew upon both Mark and Marcion’s Evangelion. The hypotheses of Garrow and Klinghardt probably deserve further examination in a future article. The Synoptic Problem is an endlessly fascinating puzzle. Scholars favoured the simplicity and explanatory power of Q for over a century, but a new paradigm might be around the corner. Jason BeDuhn, The First New Testament: Marcion’s Scriptural Canon, 2013. Delbert Burkett, Rethinking the Gospel Sources, Volume 2: The Unity and Plurality of Q (SBL/ECIL 1), 2009. Brian Schultz, “Jesus as Archelaus in the Parable of the Pounds (Lk. 19:11-27)”, Novum Testamentum 49/2 (2007). Matthias Klinghardt, “The Marcionite Gospel and the Synoptic Problem: A New Suggestion”, Novum Testamentum 50/1 (2008). Every time I see the word “Evangelion,” I think about giant robots fighting creepy extraterrestrials. Anime, you have ruined me for serious theological discussion. Haha, yeah. I was tempted to throw in a Neon Genesis screenshot but figured too many people wouldn’t get it. Hi Paul thanks for another thought provoking article. Prior to reading this I favoured the theory that Luke re-wrote Matthew. I will have to reconsider now! Long-time reader, first time commenter. Love your site. I find the proto-Luke hypothesis interesting. I am persuaded there WAS a proto-Luke used by Marcion. Matthew may have known (heck, I’ll say probably knew) of some of the traditions used by pLuke. However, I stick with the Q theory, primarily because I think having pLuke be the answer to the common source Synoptic issue creates more problems than it solves. In essence, proto-Luke needs to become so much like the hypothetical Q (rather stripped down even from what we know from the Evangelion) for the hypothesis to work that you might as well just stick with Q. And per the work of Robinson and Kloppenberg, I think theologically Q as a cohesive source makes sense. Thanks for the comment, Andrew. If you have any specific passage in mind that would be difficult to explain without the existence of Q, I wouldn’t mind having a look. I plan to focus mainly on problematic passages in future articles on the Synoptic Problem. A couple of little typos, I think: twice you say “Matt. 25.18”, when I suspect you mean “Matt. 25.28”. > … it’s unclear in Matt. 25.18 who the master is talking to. > As already mentioned, the text is ambiguous in Matt. 25.18 as to whom the master is addressing. Thanks for catching those typos, Glenn! 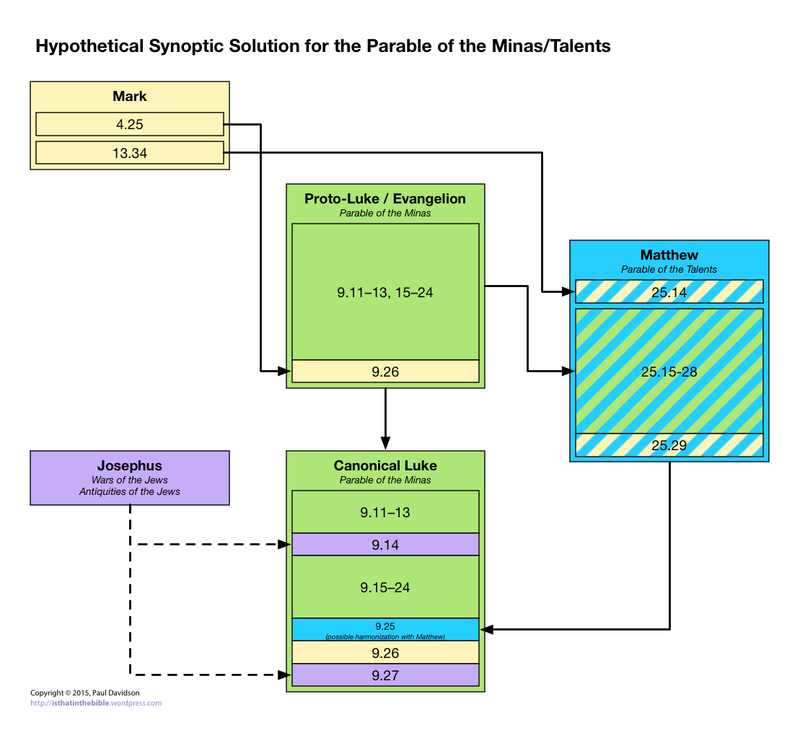 Also, the flowchart graphic for Parable of the Talents refers to Luke 9 instead of Luke 19. Whoops! I’ll have to fix that too. If, for example, the author of Luke knew Matthew, why did he completely reject great story material like the adoration of the Magi and the flight to Egypt? Maybe it was because Luke abhorred the idea that God would have allowed all the other babies to be slaughtered while Jesus escaped. He just picked something out of the first story in Antiquities of the Jews 18, like the census, to write a different account for Jesus coming from Nazareth while fulfilling the Bethlehem “prophecy”. Why provide a genealogy completely different from Matthew’s? And so on. Matthew 3:17 makes a big deal about separations of 14 generations, probably having to do with some Hebrew numerology around David’s name (DVD = 4 + 6 + 4 = 14). From Abraham to David is consistent with the OT genealogies but David to the Exile omits four names while including a name whose offspring were cursed (Jeremiah 36:29-31). The last set of fourteen only has thirteen names unless the Exile is counted as a generation. Luke had legitimate reasons to reject Matthew’s nativity and genealogy. Luke’s genealogy has 77 generations with God and #1 and Jesus at #77 with Abraham and David also on multiples of 7. Going through David’s son, Nathan, probably seemed like a good idea but Solomon was king. Thanks for the comment, Greg. I agree that these are certainly possibilities, and the basic premise of the Q hypothesis that Luke and Matthew didn’t know each other is unfounded. I will write more about what to make of the alternate nativity stories in a future article. The Sermon on the Mount Site: James and the Sermon on the Mount by Robert I. Kirby has examples from William D. Davies and Walter W. Wessel to show a lot of correlation between topics in James and sayings attributed to Jesus by Matthew. Kirby thinks James contains a body of sayings by Jesus but James’ arguments would have been much stronger if they had a “Jesus said” in front of them. Does anybody else think Matthew may have reworked the Epistle of James into Jesus quotes? That would mean Luke had to use Matthew and there would be no reason to think there was a Q document. As you point out yourself the difference between a talent and a minas is a factor of sixty. So a minas makes no difference if you have a city, but sixty minas may be very welcome even if you have “many things”. Something else entirely, but if the slaves are those entrusted with spreading the gospel, why three and ten instead of twelve?